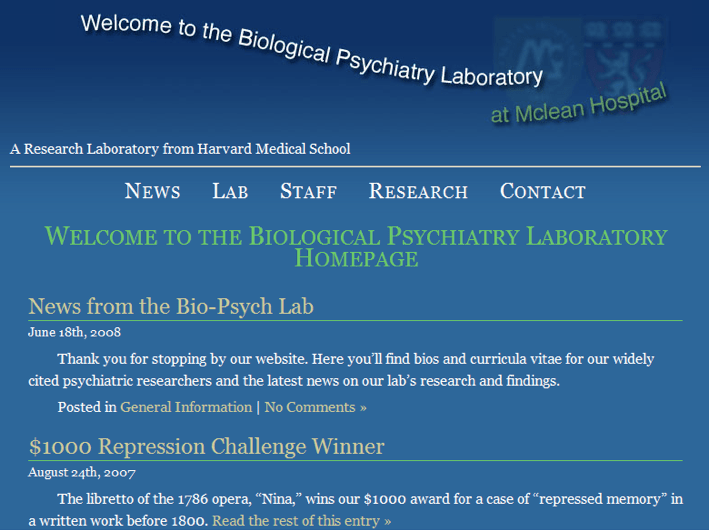 Dr. Harrison Pope got a lot of publicity in 2007 for his “repression challenge,” which offered $1,000 to anyone who could find an example of repressed memory before 1800. Pope et al. later published a paper that argued that the failure of anyone to find an example proved that repressed memory was a social construction. There is one major problem: someone did win! The winning submission was entered after Dr. Pope and his co-authors published the article that is still highlighted on his home page. The article says that the lack of any examples before 1800 proves their argument; but the article also allowed that an example that fit their narrow criteria would disprove their claim. Applying a version of logic that rivals “heads I win, tails you lose,” Dr. Pope has since claimed that he is still right, even though he lost. He has also gone to notable lengths to conceal the winner, who was acknowledged only briefly on his home page. But that heading (pictured below) was quickly removed, and for the last two-plus years the site has highlighted only the outdated article. Remarkably, Dr. Pope did not withdraw the article even though its conclusions were disproved after publication. That isn’t the only problem with the “challenge.” The definitions created by Dr. Pope were so narrow that they rejected a host of examples from hundreds, even thousands, of years ago. For example, Pliny the Elder said in the year 77AD that memory is “affected by disease, by injuries, and even by fright; being sometimes partially lost, and at other times entirely so” (Pliny the Elder, The natural history of Pliny (J. Bostock & H. T. Riley, Trans. ), London: George Bell & Sons, p. 165 (1893)). Dr. Pope rejected this evidence because, in his words, it did not specify that fear, per se, could cause memory to be entirely lost. See also Ben-Ezra, “Dissociative symptoms after plague in the 15th century,” British Journal of Psychiatry, 86:543 (2005). For a detailed critique of the contest see Goldsmith, Cheit and Wood, “Evidence of Dissociative Amnesia in Science and Literature: Culture-Bound Approaches to Trauma in Pope et al. (2007),” Trauma and Dissociation, 10:237-253 (2009).